Mossy Oak Utility LED Light | BUDK.com - Knives & Swords At The Lowest Prices! This powerful Mossy Oak dual-use light can be used as a utility light or a flashlight. The tough, compact case protects the bulbs and it will run for up to 36 hours on the 3 AAA batteries which are included. A hanging hook makes it great for lighting up project areas such as working under a house or under the hood of a car, even makes a great hunting blind light. Best deal I have ever seen for a super bright, dependable light. I purchased 5 of them and keep one handy at all times. I have not found a need to use the hanging hook, but I imagine that feature could come in handy. For night use, I keep one at my bedside. Worth every penny of the 5 buck investment. Got my light in today and man i was so impressed i already placed an order for another, and will get more in the future. Light is extremely bright and with the magnet and hook attachments you cant go wrong. If you cant find a use for this there is something very wrong with you!! 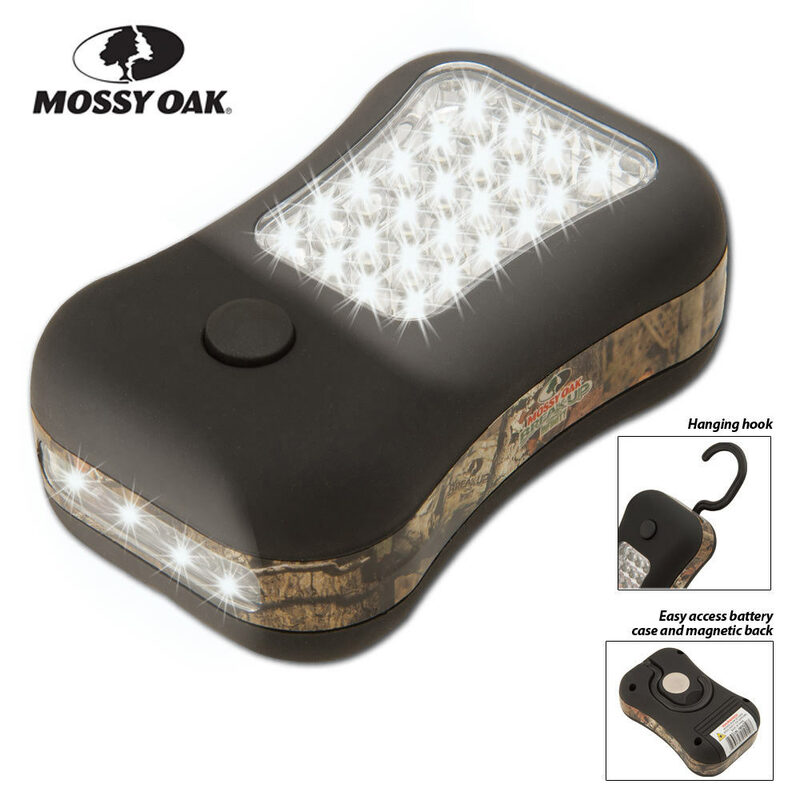 The Mossy Oak Utility LED light is an awesome device in a perfectly small package. Easy to use and eminently affordable, it provides the right amount of light precisely when and where you need it! I was changing the batteries in this great very bright led flashlight, and as I went to pick up the main body, it was somewhat "stuck" to the top of my microwave. And, after having had a few of these lights for awhile now, I just realized that the metal thing on the back is a FAIRLY HEAVY DUTY MAGNET!!!! Unreal, I felt stupid and pleasantly pleased at the same time. These put out so much bright light. Highly recommend, and now I can just attach to the fridge or metal anywhere! I have looked for LED lights and lanterns for a while now. I ordered 4 of these and boy was everyone impressed, I had to give one to my brother when he saw it work. He had bought a similar light from Harbor Freight but we liked these much better. Who ever designed this really put a lot of thought into these lights, I always notice a really well thought out design. I just ordered 6 more today and if the price goes lower I would order more to give away. I'm glad I ran across these I was giving up hope of ever finding an LED light that gave off a lot of light and didn't cost so much. So when the power goes out we will have these all through the house. Keep up the good work BudK. Thank you!!! !